Definition at line 1116 of file nt_native.h. Definition at line 1127 of file nt_native.h. 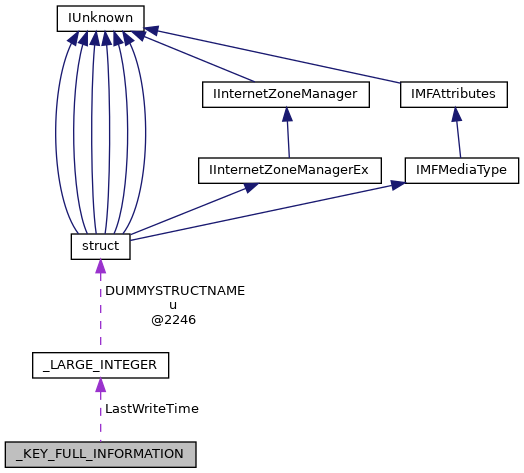 Referenced by RegQueryInfoKeyW(), and Test_KeyFullInformation(). Definition at line 1120 of file nt_native.h. Referenced by LsapRegQueryKeyInfo(), RegQueryInfoKeyW(), SampRegQueryKeyInfo(), and Test_KeyFullInformation(). Definition at line 1119 of file nt_native.h. Referenced by LsapRegQueryKeyInfo(), SampRegQueryKeyInfo(), and Test_KeyFullInformation(). Definition at line 1117 of file nt_native.h. Definition at line 1123 of file nt_native.h. Definition at line 1122 of file nt_native.h. Referenced by IopQueryBusDescription(), KspEnumerateBusRegistryKeys(), LsapRegQueryKeyInfo(), PciAcpiFindRsdt(), PciGetIrqRoutingTableFromRegistry(), RegQueryInfoKeyW(), and Test_KeyFullInformation(). Definition at line 1126 of file nt_native.h. Definition at line 1125 of file nt_native.h. Definition at line 1121 of file nt_native.h. Referenced by GetComputerIdentifier(), IopQueryDeviceDescription(), KspEnumerateBusRegistryKeys(), LsapRegQueryKeyInfo(), RegQueryInfoKeyW(), SampRegQueryKeyInfo(), and Test_KeyFullInformation(). Definition at line 1118 of file nt_native.h. Definition at line 1124 of file nt_native.h. Referenced by HalpQueryPciRegistryInfo(), IntLoadFontSubstList(), LsapRegQueryKeyInfo(), PciBuildHackTable(), RegQueryInfoKeyW(), SampRegQueryKeyInfo(), and Test_KeyFullInformation().